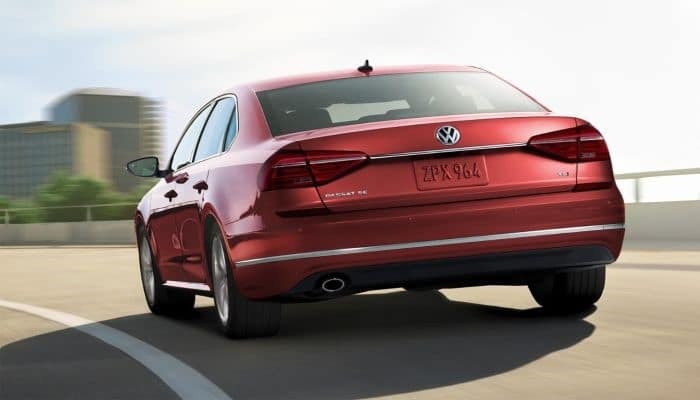 The 2018 Volkswagen Passat is a great combination of fuel efficiency, space, and drivability. All these together make for a versatile and enjoyable experience when using the most powerful sedan by Volkswagen. The Passat S will get drivers the basic 174-horsepower 2.0-liter turbocharged engine and 6-speed automatic transmission. Along with its quality and features, Volkswagen offers some great consumer protections for drivers’ benefit. The new Vehicle Limited Warranty covers 6 years or 72,000 miles, whichever happens first. This even transfers over at no cost if a driver sells their Passat. This offer is longer in both years and mileage than other competitors in its class. Drivers can keep the kids occupied while they’re focusing on driving by using the Passat’s suite of services to turn the car into an entertainment center. Drivers can use the VW Car-Net App-Connect to connect their compatible smartphone with Apple CarPlay, Android Auto, or MirrorLink. From here, use the touchscreen to access everything from mobile apps to streaming music. Don’t worry about those obstacles behind the vehicle. The rear-view camera system lets drivers see everything while backing up. Keep track of important things like, the time, length of the drive, average speed, current fuel consumption, all in full color, with the Multifunction display (MFD). Stay focused on what’s going on with the VW Car-Net Guide & Inform. Take advantage of features like enhanced navigation, traffic, sports scores, weather information, and more. With a subscription, drivers can take this to the next level by using the Security & Service Feature to keep track of where they parked or whether the doors are locked. Use the Blind Spot Monitor to sense things that may go unseen when changing lanes. This function helps maintain a certain preset distance from the car in front. If the car in front speeds up or slows down, the sensors detect any changes and the Passat will then automatically follow suit. This feature has drivers covered if they find themselves drifting into another lane without using a turn signal. It will steer to keep drivers in their current lane, within the limits of the system. ParkPilot uses sensors to alert drivers while backing out of or driving into a parking spot. Signals and displays determine how much space there is behind the vehicle, as well as in front for certain vehicles. If a driver gets get too close to an obstacle, a tone will sound a warning, along with the ability to gauge how close the vehicle is via the display. The Park Assist function can also help with steering when parallel or perpendicular parking. Visit Stevens Creek Volkswagen of San Jose to check out our extensive inventory of the 2018 Volkswagen Passat.